Well, it's that time of year - summer on San Juan Island, aka tourist season. Don't get me wrong, it's great that so many people get the chance to see killer whales in the wild, but as a naturalist, it's hard not to cringe sometimes at some of the "facts" you overhear people sharing about these whales. The worst part is, many of these don't just come from visitors, but also come from the mouths of locals, some of them kayak guides or naturalists. When people get excited about the whales, there's an amazing opportunity there to educate them, but that education is only valuable if it's correct! So here are a few of our favorites - with the truth. June 22nd L-Pod pass. From left to right: L55 Nugget, L118 Jade, L103 Lapis, L105 Fluke, L82 Kasatka, and L95 Nigel. We know Granny is 103 years old because we first saw/photographed her in 1911. I can't believe how often I hear this one. I know it's a nice idea, but the truth is, we have no idea how old Granny is. Her birth year of 1911 is an estimate researchers arrived at by making some key assumptions about her relationships to other whales: namely that she was the mother of J1 Ruffles and that he was her last calf. The truth is, the earliest photographs of Granny were taken in the late 1960s, when she was already an adult. So while we're sure she's an old whale, the age estimate could be off by several decades one way or the other. Also, photo ID studies of killer whales didn't start until the 1970s. Granny and other older whales are slower/less active than younger whales. Old age doesn't slow whales down at all. Every whale, from the youngest calf to the oldest matriarch, has to be able to keep up with the pod, which travels up to 100 miles a day. Granny is often in the lead, sometimes a mile or more ahead of the rest of the pod. And the old girl has still got it: she's been known to breach, spyhop, and tailslap with the best of them. I've seen the residents eat seals, pink/sockeye salmon, etc. The locals in particular really like this one. 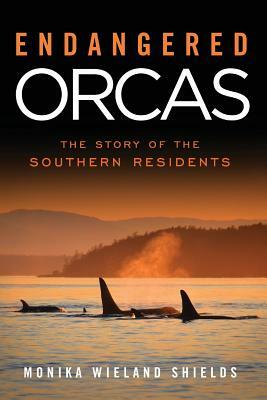 First of all, there are two types of local killer whales: marine mammal eating transients and fish eating residents. These two groups are most strongly differentiated by what they prey upon, so if you see a whale take down a seal, it's a transient. Secondly, it is hard to believe at first that residents will preferentially feed on Chinook salmon even when other fish species are more abundant, but that's what decades of research have shown. This paper summarizes it nicely. They do occasionally eat other fish species, but in the summer months in the San Juans, they are eating almost exclusively Fraser River Chinook. The whales respond when I scream at them, sing to them, my baby cries, etc. Honestly, we all have our superstitions about what bring the whales close, but most if not all of them are just wishful thinking. For one, the sound barrier between air and water is pretty good, so when you're on shore, chances are the whales can't hear you at all. Sometimes sound can travel through boat hulls, but I'm still pretty skeptical any human noise is loud enough to reach the whales. The whales do travel close to people by choice, sometimes even expressing some mutual curiosity, but I think this is purely on their terms and not dictated by anything we do. The names "resident" and "transient" are very misleading, I'll give you that. They originated when researchers saw the residents on an almost daily basis during the summer months and had only rare encounters with the transients, but as mentioned above, the true difference between them is their diet. Fish-eating and mammal-eating orcas would be more accurate descriptors. The residents do indeed spend longer lengths of time in the Salish Sea than transients (which are also started to be known as Bigg's killer whales), and they can and have been seen here in every month of the year, but they tend to roam the rest of their range more in the winter months. They are not, however, migratory like some of the larger whale species are. They don't have a breeding grounds and a feeding grounds, and when they're heading north in Haro Strait they're not "migrating". These guys feed and breed all year round, and similarly can be found anywhere within their range from British Columbia to central California at any time of year. "What time do the whales come by?" is the most notorious tourist question every year. To give people the benefit of the doubt, some animals do have certain patterns, such as being more active in the morning or evening, etc. Additionally, the whales do sometimes get into certain cycles; for instance, when they're making their regular circuit from the San Juan Islands to the Fraser River, it often takes about 24 hours, meaning for several days they may consistently be seen on the west side of San Juan in the morning. But I'm fond of saying that just as soon as we think we've figured out a pattern for the whales, they change it, and do something different. While they do have certain typical travel patterns, the truth is they can be in any place at any time of day, and there's no regularity to what time of day they're seen in a particular spot. It's a common configuration among social animals, so it's easy to forgive this mistake at first: that the biggest whale out there is in charge and is surrounded by his harem of females. What's especially frustrating is when you still hear people saying this after having imparted some more accurate information as a naturalist on boat or on shore! Researchers first thought the big bulls were probably the top dogs, too, but over time we've learned that resident orca societies are matrilineal. Each pod is made up of a female, her offspring, her daughter and sisters' offspring, and so on, with up to five living generations at a time. Those guys sporting six-foot dorsals are really big mama's boys, spending their whole life in mom's family group and often swimming right beside her as an adult. Mating only occurs when unrelated families get together to socialize. They're putting on a show for us!I like to call this the SeaWorld mentality. It shows just how far our perceived dominion over nature has gone. I understand for many people they use this phrase without really believing the whales are doing something for our benefit, for instance, by saying "That was quite a show!" after an amazing close passby. But the reason this phrase rankles a lot of us naturalists is because there are indeed those out there who think the whales are showing off for us. I can say with 100% confidence, however, that the whales are not coming close, breaching, being active, or anything else for us. Everything they do, they're doing it because they want to. Actually, that's the real beauty of watching wild killer whales. What an honor to be able to witness whales doing what they want to do. SO much better than SeaWorld. That whale is so fat - she must be pregnant!Okay, this one has become an especially hot topic among our local whale community right now. 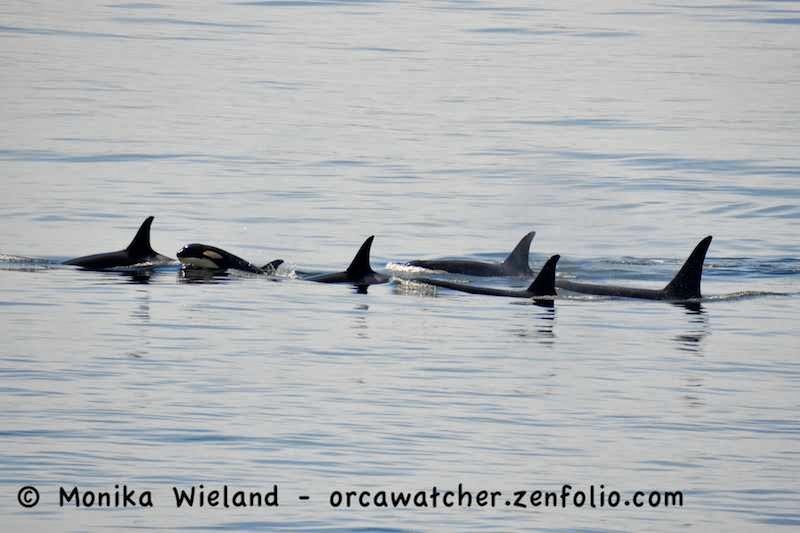 Perhaps it's because it's been since August 2012 that we've had a new calf born to the Southern Residents (not good - but that's a subject for another blog post), but the topic of orca babies has been prevalent lately. Rumors about which whales might be expecting, based mostly on large bellies visible in breach photos, have been flying back and forth over Facebook during the last couple weeks. We do have many females who are "due" to have a baby, either because of their age or the time it's been since they had their last calf. But the reality is orcas don't show any reliable visible signs of pregnancy. There have been times people are sure a whale is pregnant based on how she looks, but she doesn't ever show up with a baby. (Stillborn calves could be a possibility, but it's happened to often for that to always be the case.) Other times we can go back and look at photos of a whale who gives birth to see what she looked like ahead of time, and again, no obvious clues. So while we're all more than ready for little J50, K45, or L120 to join us, we have no idea when that will be or who will be the lucky mom. So good to have a resident myth buster among us! Thanks for sharing this, Monika! "...big mama's boys." I love it. Thanks for the post.